Eric Wilkinson formed Wilkinsons in 1993, having previously spent over 25 years in the industry, working in a number of senior positions for agencies across the town. Initially a sales office, the premises and number of staff have expanded over the years as the Wilkinsons name has become recognised and trusted locally and as the requirements of our customers have changed. As the business grew, it became apparent that many of the people that had purchased property from us, came back to ask whether we would manage their properties on their behalf. 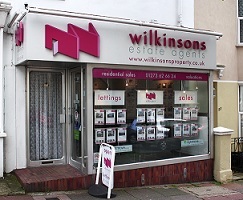 To fulfil this need, Wilkinsons Lettings was created and now boasts a substantial presence in Brighton and Hove for those who wish to let their home, be it to professionals or as student accommodation. In 2001 Eric's son Ian joined the company, providing Eric with some much needed assistance in the sales area and fulfilling his dream of making the business a truly family affair. Ian has become an integral part of Wilkinsons and the business is now run very much as a team, helping us to continue providing the quality of service that our customers have come to expect. Search our database of properties for sale and to let in Brighton & Hove.